Words by owner of watch. Photograph taken by me, by a window table in a restaurant in Dempsey Hill, Singapore. I bought this a few years ago while I was visiting Europe and Curtis Thomson advised me to visit the watchmaker Jean Baptiste Viot since France was my last stop. I tried to read up more about him prior to the visit. There wasn't much information about his watchmaking back then but I did find out JB belongs to an underground movement called Urban eXperiment. Apparently they go around infiltrating official buildings and do restoration. Eh Mission Impossible in horology? I got to meet this guy! This watch is quite a departure from my usual taste(usually A. Lange Sohne). A bit of details overload and yet the quirkiness somehow holds the whole design together. 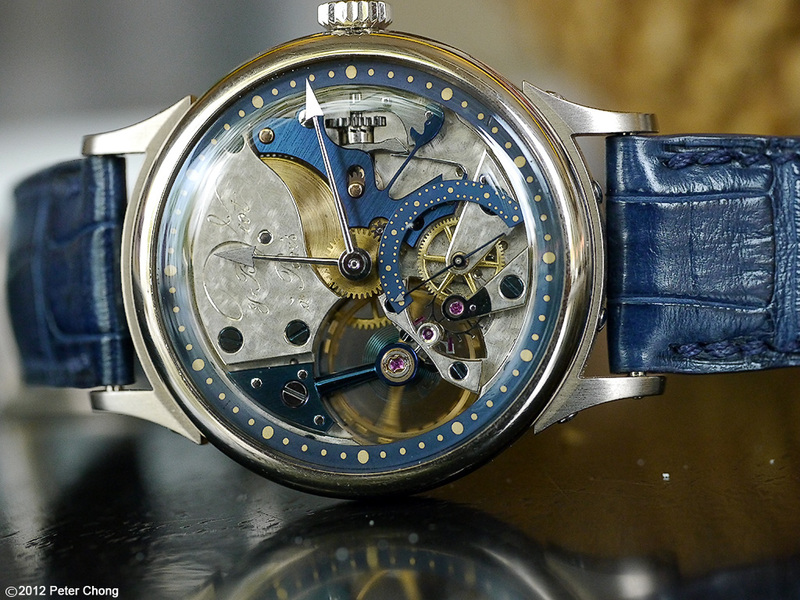 It reminded me of earlier days FP Journe especially his prototype remontoir Tourbillon. It is also based on the Peseux 260 which I understand is a chronometer movement and the same as Kari Voutilainen's Observatorie. I found it fascinating to see individual interpretations from different independents. The JB prototype piece has not been spoken for yet and I knew I got to act fast. Rarely do you get a chance to buy a watch that was the testbed of a design and furthermore it was made by the watchmaker himself, not assistants. JB was surprise and said a normal production piece will be of better quality. But I know this watch will have something non of the others will have, it will have history and a soul. Prototype pieces are always special in that sense.